We designed Numerics to remove the guesswork out of the decision making process. 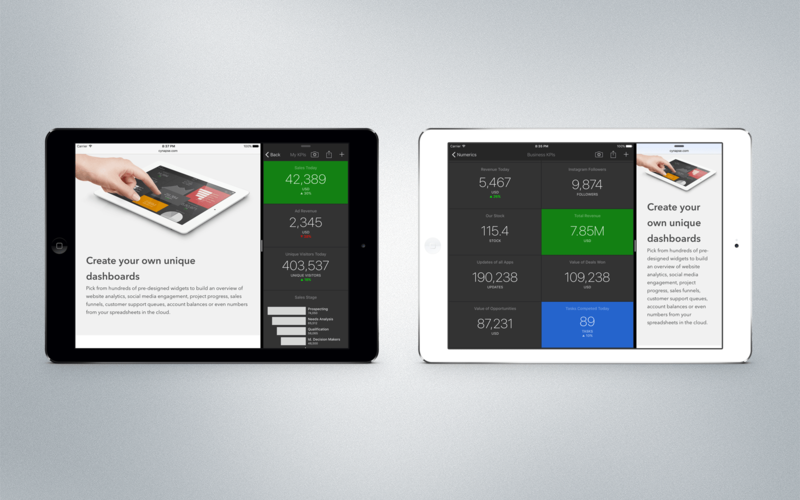 And are constantly working to improve the way you, our users, consume and interact with your important metrics. 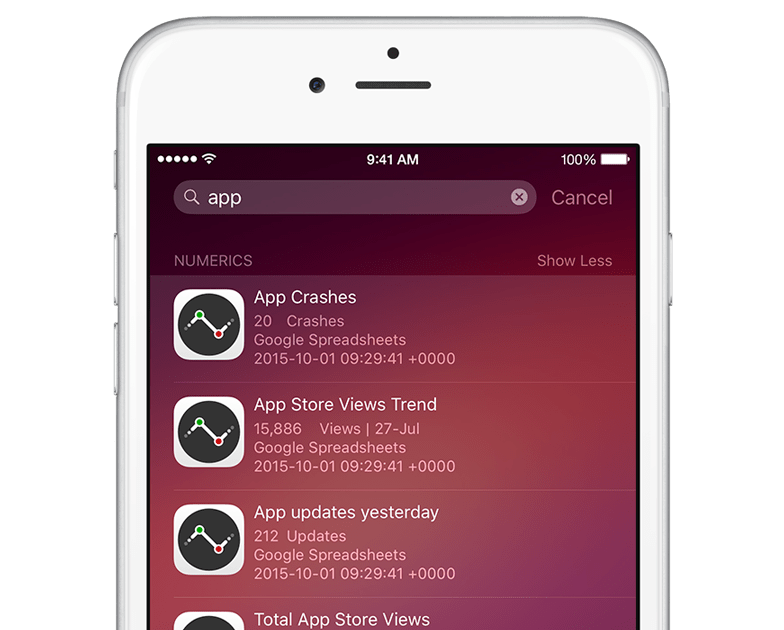 To do this, we always like to take advantage of the latest iOS features and technologies and today, we are thrilled to announce the availability of Numerics 4.1. Numerics v4.1 adds Multitasking on iPad with the Split View and Slide Over features, allowing you to use Numerics for iPad and any other app at the same time. Numerics has been optimized for Multitasking and widgets adapt and reflow to fit each of the different split view scenarios uniquely. As a secondary app in the slide over mode, Numerics works in a fully functional compact mode and is super useful for keeping an eye on your numbers while working on other stuff. Say you are working on a report in Microsoft Excel Spreadsheet and would like to take a quick glance into the metrics you are tracking in Numerics. Without leaving your app, you can now open Numerics with a single swipe from the right edge of the screen, peek into Numerics to see the number and then slide the app away to get back to what you were doing. It’s a really fast way to glance at your metrics without interrupting your workflow. With the Split View, you can go a step further - work with Numerics along with any other app open and active side by side, at the same time. For example, you can have your Numerics dashboard open to take screenshots of the metrics you want to use in your weekly Keynote presentation and have your slides open alongside at the same time. You can take a snapshot of the number and simply paste the image into your Keynote slides. We are always on the lookout to enable intuitive ways for you to easily access your most important number. Widget notifications, Today Screen widgets, and Numerics for Apple Watch are all designed with this goal in mind. So the new Spotlight Search APIs got us very excited. Numerics v4.1 takes full advantage of Spotlight search. You can now search for any widget you’ve created in Numerics from the iOS home screen by title and see a quick preview of the number right there. Tapping on the widget takes you straight to the widget zoom view. Numerics, because its all about numbers, it wouldn’t be beautiful if it weren’t for its typography. Tremendous care is taken to present each metric, its supporting units and title to make your metric pop. With v4.1, we have adopted the new and modern San Francisco font introduced in iOS 9 for the Numerics interface. The San Francisco font on iOS is designed to be easy to read in any text size. With the new typeface, Numerics looks much crisper and more beautiful on all iOS devices. 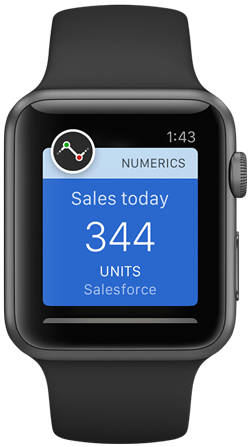 The new self-sufficient Numerics for Apple Watch now keeps in sync with its companion app on the iPhone in real time and ensures you are always looking at the freshest numbers when you lift your wrist. 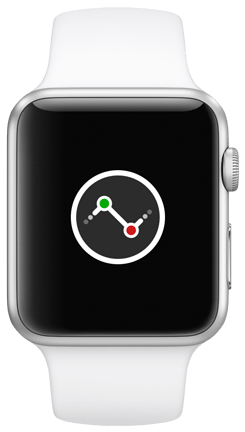 Complications - the tiny areas on the watch face that display little snippets of information on the Apple Watch are one of the best features of watchOS 2. We are excited to support this new feature with Numerics 4.1. You can now track your most important number right on the watch face by setting it as a complication. Numerics complications are currently compatible with the Modular, Utility & Mickey Mouse watch faces. Any of Numerics widgets can be set to show in the large complication zones of either of these watch faces. 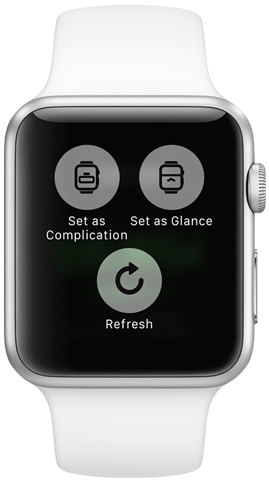 With v4.1, you can now have two of your most important widgets set for quick access on your Apple Watch via Glances and Complications. To add any of the widgets as one, Force Tap on the zoom view of the widget to pop up the options and you are ready to go. Complications finally completes the circle for Numerics of enabling you to know your most important metric, just by lifting your wrist. The already popular Modular face now has a new Multicolor option, coloring each of the complications in a different color. We liked the vibrant look of the watch face with the multicolor option and have added support for the same in Numerics complications too. The widget color set by you in Numerics reflects in the title of its complication when the Multicolor option is chosen, creating a vivid and attractive watch face. Notifications are essential to Numerics. And some of you have mailed us complaining about the inconsistency of the alerts on the Apple Watch. We have been listening and working hard to ensure you get notified when a widget’s data changes. 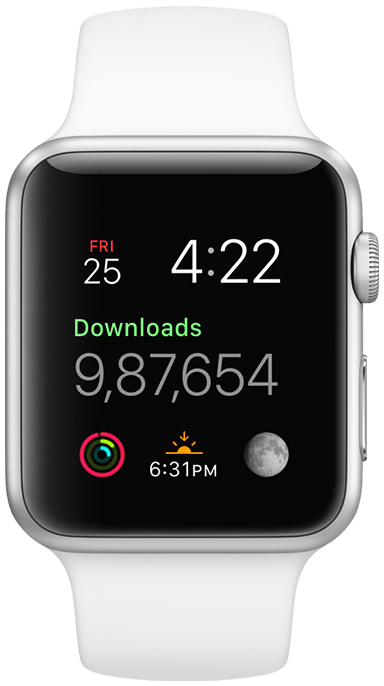 With the re-engineered architecture for watchOS 2, Numerics keeps your widget data always-up-to-date, making it more reliable to monitor and track your key numbers. Along with the big updates above, Numerics v4.1 also bundles in the new Safari View Controller and numerous framework improvements and fixes. We are super excited about this jam packed update and hope you like it too!